This is the first time OnePlus has collaborated with a retail outlet to sell its smartphones offline in India.OnePlus will make its OnePlus 5 flagship available in Croma retail outlets across the country from September 19. The company is offering OnePlus Bullets V2 earphones and a Flip Cover with every purchase. 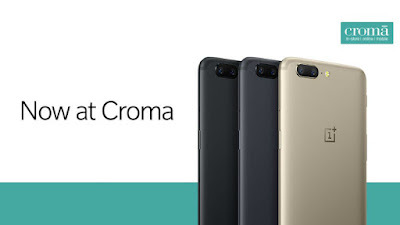 For existing OnePlus 5 users, the company is offering a free Flip Cover available only if the customer visit Croma Retail store. OnePlus 5comes in 6GB RAM/ 64GB storage variant, 8GB RAM/ 128GB Colour options include Slate Gray, Midnight Black, and Soft Gold. The OnePlus 5 has a 5.5-inch full-HD screen powered by the Snapdragon 835 processor It has a16-megapixel and telephoto 20-megapixel sensors, while the front camera has 16-megapixel resolution. As for the battery, OnePlus 5 comes with a 3300mAh battery with Dash Charge support for quick-charging.It runs on Android 7.1.1 Nougat with OxygenOS on top of it.